These aren’t your average teardrop trailers! These off-road ready teardrop trailers feature heavy-duty steel chassis, Timbren off-road axle-less suspension with electronic brakes, Lock N Roll articulating hitch, off-road all-terrain tires, making it easy to go just about anywhere! All this ruggedness is paired with a comfy 6” thick Queen size memory foam mattress, making adventuring in these trailers extra dreamy. Plus the rooftop tent adds sleeping for an additional 2, so you can bring the whole family! Bring your own tow vehicle, or pair with one of our 4x4 Toyotas or 4x4 Truck Campers and get a combo discount! Check out our Off-Road teardrop trailers options, ‘Scout’ and ‘The Recon,’ below. This off-road ready teardrop trailer is ready to go anywhere. Featuring heavy-duty steel chassis, Timbren off-road axle-less suspension with electronic brakes, Lock N Roll articulating hitch, off-road all-terrain tires, LED reverse lights. Traveling or don’t have a vehicle that can tow? No problem! Pair Scout with one of our 4x4 Toyotas or 4x4 Truck Campers and get a combo discount! Contact us to learn more! Our Teardrops NW Scout off road teardrop trailer can adventure to places most trailers can only dream of. The teardrop features a 6" memory foam queen size mattress below and has a CVT Mt. Rainer Stargazer roof-top tent up top which accommodates 2 additional adults and has two massive skylight panels to let the sun or starlight in. The trailer is also equipped with a large exterior awning. Comes with a full camp kitchen including two-burner stove, 50 liter Engel Cooler, and 5 gallon water jug. As always, all necessary camp gear is included. 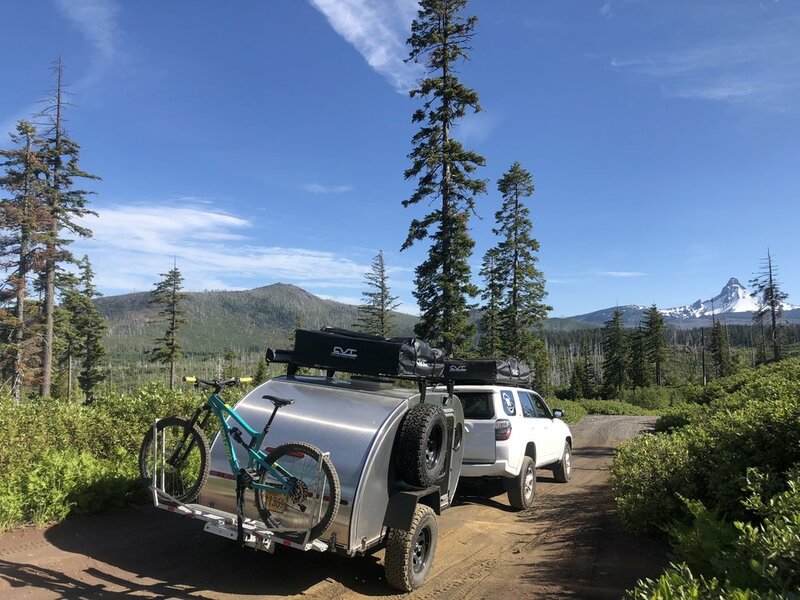 If you’re looking for a little more room to stretch out, our Teardrops NW Recon off road teardrop trailer is the choice for you. The teardrop features a 6” memory foam queen size mattress, with extra legroom, and has a roof-top tent up top which accommodates 2 additional adults. The trailer is also equipped with a large exterior awning and Road Shower. Comes with a full camp kitchen including two-burner stove, 50 liter Engel Cooler, and 5 gallon water jug.